When I was in the Sixth Form it was really cool to have one of those giant pots of Vaseline. We took it to every lesson and always had it in our bag, pulling it out to share around and dab our fingers in eachother’s pots, ahem. Why we thought it was cool to treck around with an ugly and inappropriately sized pot I’ll never know, but when the much teenier tins arrived it was a good day. I always have a little tin in my desk drawer for lip emergencies, but the dilemma is always where to wipe your greasy finger when you’re done! 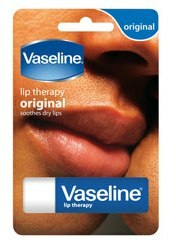 Now Vaseline have launched a range of sticks which mean that’s an issue no longer… welcome aboard Vaseline Lip Therapy Sticks. These are available in four variants to please every one of you, as well as matching to the little tins that are already available – the regular ‘classic’ blue, aloe vera, rosy lips and cocoa. They’re simple, yet effective and contain the goodness of the original petroleum jelly with lots of added goodness. Not only do they contain panthenol and pro-vitamin E to hydrate and protect against free radicals, but they also each have their own specific ingredient to make your lips luscious – aloe vera to soothe and protect, shea butter to nourish and rose oil for a tinted sensual experience. I’m addicted to the cocoa variant… it smells delicious, nourishes my lips and doesn’t even leave goop on my hands. These are available now from all your usual places, priced at a very reasonable £1.99. My lips and petrolatum/Vaseline just do not agree. They feel quite good when I put it on, but the next day I can basically peel them off.I blame the petrolatum, because other ingredients like the oils in e.g. the Hauschka chapstick do not have that effect. You may be better off with these ones then – they contain only a little jelly and mostly other stuff to basically form the stick. I found these much more moisturising than my tin too! I love Vaseline,a nd those lipbalms must be so much more hygienic than the tin version!